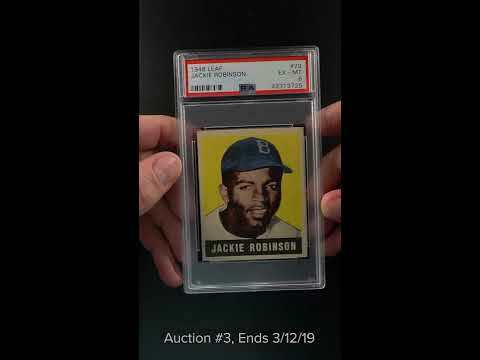 Without question the '48 Leaf Jackie Robinson is among the most important rookie cards in existence and is seldom seen on the public market in such high-grade. In 1947 Jackie Robinson broke Major League Baseball's color barrier and paved the way for Baseball's great future. Jackie is a critically important American hero who is hugely popular among intelligent investors. Presented here is among the finest copies we've brokered in some time, a beautiful EXMT copy which has just been returned from PSA. This card screams quality with it's glowing yellow background, virtually zero excess print and flawless registration. The edges are perfectly maintained with out chipping and the borders are immaculate. The card possesses wonderful framing and four minimally EXMT corners to boot. All told, this is a tremendous example of an absolutely iconic rookie card. As investors continue to aggressively target this premier commodity the value of this card seems poised to soar over the coming years. Enjoy! One of over 17,000 cards, lots, and sets up for bid in our 3rd Auction of 2019. Click on the link above to view the other PWCC auction lots. The PWCC Vault is now live! Open a PWCC Vault account and receive a custom Vault shipping address. Purchases shipped to the Vault receive free shipping and reflect Oregon's 0% sales tax rate.